Michigan defeated Texas A&M Thursday night to move to the Elite Eight. John U. Bacon for Friday, March 23. I didn’t know the University of Buffalo had a Division I basketball team until they upset 4th-seeded Arizona. But then, I didn’t know the University of Maryland at Baltimore County was a school until its 16th-seeded basketball team pulled the upset of the ages, knocking off top-ranked Virginia to become the very first 16th seed to beat a one seed in the tournament’s long history. To his credit, Virginia coach Tony Bennett handled the historic upset with uncommon grace, saying, “This is life. It can’t define you.” But this Tony Bennett left his heart in Charlotte, North Carolina. On the fun side, Loyola-Chicago surprised both Miami and Tennessee, led by team chaplain Jean Dolores-Schmidt, a 98-year old nun in a wheelchair. She became a national sensation cheering on her Ramblers from the stands. May I suggest a new slogan: Fear the nun. The list of victims included 3rd-seeded Michigan State, which lost a two-point cliffhanger to 11th seeded Syracuse. Thus ended another great season for Spartan head coach Tom Izzo, who won his eighth Big Ten regular season title, and 13th overall. 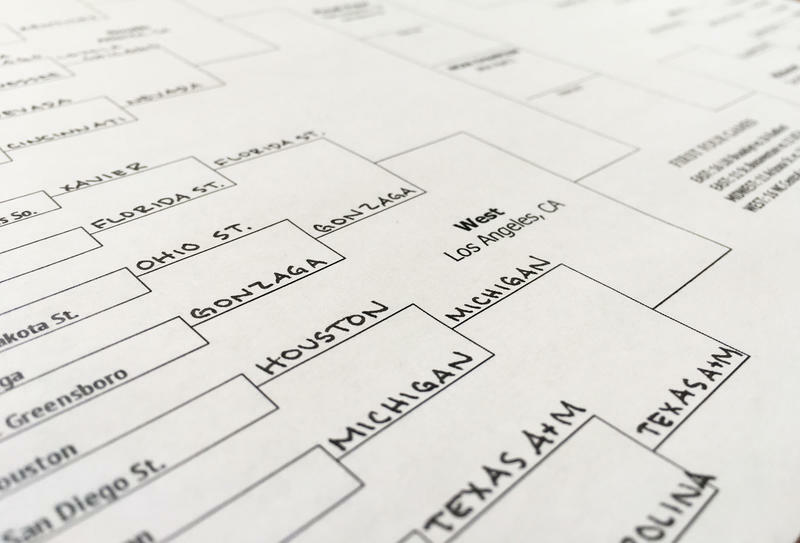 The Spartans were a favorite of many experts to win the NCAA tournament – which shows you what that’s worth. On Michigan’s side of the bracket, the top five teams all went down before the weekend ended. That left the Wolverines as the highest seed still standing – but even that took a minor miracle. After winning their second-straight Big Ten tournament title, the Wolverines had to wait 12 days to play again. They came out sluggish against Montana – Montana plays basketball? – falling behind 10-0 before taking over late in the game. The next round was even scarier for the Wolverines, when they trailed Houston by two points with just 3.6 seconds left. They’d been shaky all night, missing free-throws and lay-ups, but their solid defense kept it close. Coach John Beilein drew up the final play, and it was a beauty. Michigan threw the ball to Muhammad-Ali Abdur-Rahkman – yes, that’s one person – while he was running up court. When he drew two defenders, he flipped the ball over to freshman Jordan Poole, who hadn’t scored a point the entire half. Now he had the ball in his hands, a half-mile from the basket – and he drained it. All net. The three-pointer sent Houston packing, and Poole’s teammates chasing him in sheer joy. The only pretty part of the win was the last shot. But at tournament time, there are no ugly wins. You either lose and go home, or you survive and advance. After another win Thursday night, Michigan is still alive, and now has a much easier path to the Final Four since so many good teams have gone home. If the Wolverines stick around long enough, the national press might discover that they represent the antidote for all the bad press college basketball has justly received this year, from FBI investigations to assault charges to whatever mess comes out next. This is a team led by a coach who is so squeaky clean that, he once said of a party, “It was crazy. We had subs.” As in, submarine sandwiches – commonly served in junior high school cafeterias. Well, if that’s Beilein’s idea of crazy, Michigan fans should be grateful. After the Houston win, Beilein donned a plastic poncho, swimming goggles, and a jumbo squirt gun to shower his players in a post-game celebration. Yes, it’s all that corny. Whether you’re a Michigan fan or not, or don’t even care about sports, you might find yourself cheering for this team. And if the cleanest team in the tournament wins the whole thing, it would be the greatest upset of the year.